Charles Gibson was an established a cultural icon when he created the Gibson Girl. He combined both the voluptuous woman with the slender woman, creating a woman who was slender and yet with ample bosom and bottom. She an almost impossibly tiny waist and drove men crazy everywhere she went. Just like the flapper that would come after her, the Gibson Girl was the iconic image of a woman of the early 1900s. She might still be wearing an Edwardian style corset, but there was just something about her that made it clear that she wasn’t going to be bound by the constraints of the day. 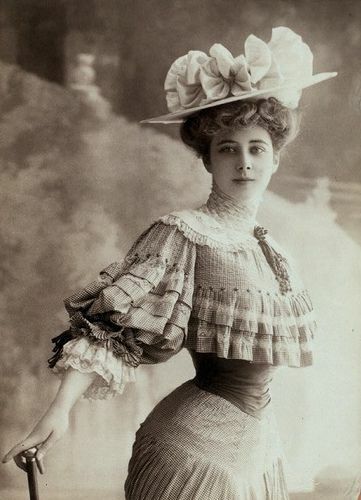 The image of the Gibson Girl could be considered as overwhelming as the images of modern day Barbie. Just as many admire Barbie, there were others who scorned this ideal that Charles Gibson created. Some consider her the first national standard of beauty, as Charles Gibson’s artwork was shown all over the country. Never before had the image of a woman been so prevalent. America was an optimistic country when the Gibson Girl held court. Fortunes were booming and it looked as though life would only continue to get better and better. It was this spirit that revived the ideals of romantic love and the romance that the Gibson Girl personified. She was a modern woman who had a great deal of independence and was not held under the thumb of men. Instead, her beauty and spirit made men fall at her feet. “She was taller than the other women currently seen in the pages of magazines.. infinitely more spirited and independent, yet altogether feminine. She appeared in a stiff shirtwaist, her soft hair piled into a chignon, topped by a big plumed hat. Her flowing skirt was hiked up in back with just a hint of a bustle. She was poised and patrician. Though always well bred, there often lurked a flash of mischief in her eyes,” said Susan E. Meyer in America’s Great Illustrators*. It’s important to understand the the Gibson Girl was not The New Woman. The Gibson Girl would never participate in the suffragette movement while the New Woman would. The Gibson girl was too refined to think of something like that, even if she was holding the hearts of men in the palm of her hand. Later, when World War I turned the optimism of America to cynicism, the flapper would replace the Gibson Girl. But while the optimism remained, so did she. You can see more beautiful images of the Gibson Girl in this 4 minute long youtube video – The Gibson Girl. It’s an interesting period to be studying. This has added some info for me. Thanks for an interesting post.